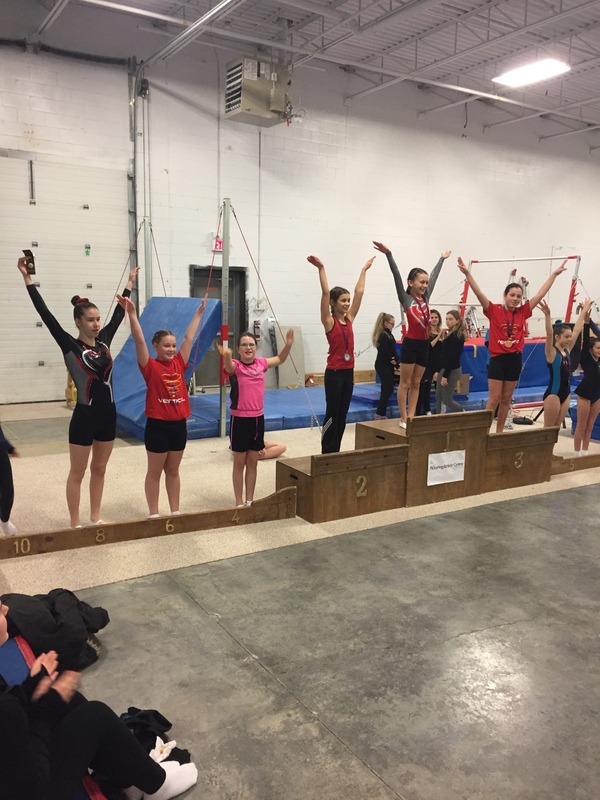 Cambridge Kips kicked off February with 14 medals and 26 Top 8 finishes across its competitive Women’s Artistic and Trampoline Programs. In their first competition of year Kips’ T&TInterclub athletes soared into the season beginning with a 1 st place finish for Meaghan Neuman and Lauren Muscat in their Synchro Trampoline routine, followed by top-two finishes on each of their individual events. Close on their heels came a 2 nd place, two 3 rd places, a 4 th place, and a 6 th place finish in the double mini tramp event for Julian Colins, Stephan Kotlyachkov, Hannah Gladwish Nicholas Berzak, and Devon Pedwell, respectively. The following weekend at the 1st Ontario Cup in Markham, Jorja-Paige Pettigrew and Lindsay Boulanger took 4th in Provincial Level 2 Synchro Trampoline. Ava Hawco made her Provincial debut with twin bronze medals in Double Mini Tramp and Trampoline. Jefery Colins, Eli Gilbert-Shaw, and Hayden Bradshaw had individual Trampoline finishes of 5th, 9th, and 11th in their respective age categories. New to our program Emily Larsen competed in her first ever Trampoline competition and was the only Kips athlete to compete in all four events.